To get the best out of KHelpCenter you must first create the searchable index files. This can take a minute or two, and it's worth opening the 'Details' so that you can watch it build the indexes. 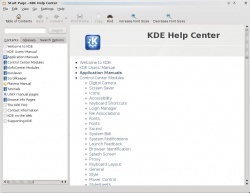 You are most likely to use KHelpCenter from a KDE application, where the manual for the application you were using will open in the main window. The left-hand panel has three tabs. The first tab, Contents, gives you links to a great deal of general information. If you are new to KDE SC 4 you will particularly want to take a look at the Plasma Manual and the Tutorials. The Glossary tab lists terms alphabetically or by topic. 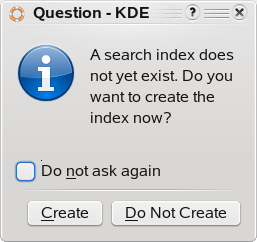 The final tab, Search, offers the choice of searching UNIX manual pages, application page, or both. You can select 'AND' or 'OR' search on terms. This page was last modified on 19 September 2010, at 18:28. Content is available under Creative Commons License SA 4.0 unless otherwise noted.